Celebrating Green: As Color, As Concept, As Cause Green has taken on many meanings — envy, ecology, money and more. A new exhibition at the Textile Museum in Washington, D.C., salutes the color of spring, and all that it has come to symbolize. In New Jersey, artist Nancy Cohen explored ecological green in the state's waterways. She traveled along the Mullica River, on foot and by boat, and "spent some time meeting with marine biologists and environmentalists," Cohen says. "The water is a brownish color because cedar trees leach into the water, and even though the water's clean, it has a kind of tea color. As the river progresses and moves toward the ocean, it becomes bluer and bluer." 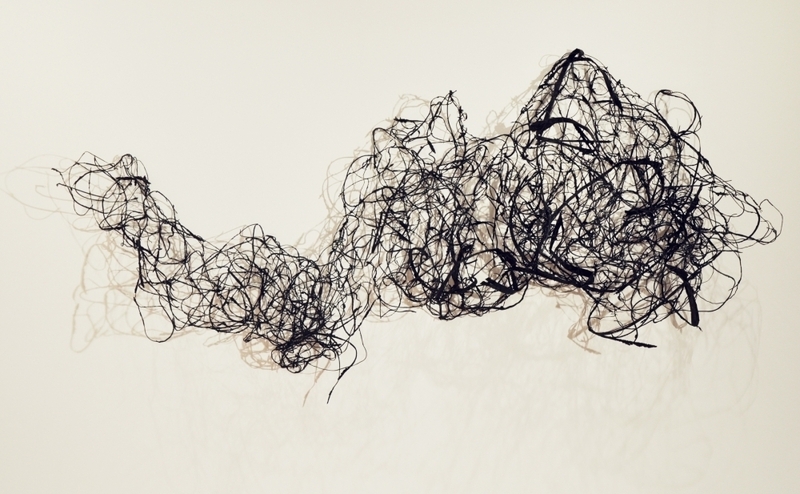 Cohen translated what she saw into a sculptural installation (above) that runs some 35 feet along two walls of the Textile Museum — pieces of handmade paper, attached to wire frames, in varied shapes spill down the walls and onto the floor like water itself, fragile and strong. In both concept and color, green is complex. "As an intellectual vibration / smack dab in the middle of spectrum / green can be a problem," observed Chicago vocal artist Ken Nordine. Wall Tapestry is made from shreds of old tires that artist William Knight found strewn along the sides of the New Jersey Turnpike. One of the problems, years ago, was creating the color for fabrics. Back in the days before synthetic dyes, green was tricky to achieve. After blue — the water, the sky — green is probably the color we most see in nature. But there isn't a single plant that creates a really stable green dye, curator Lee Talbot explains, so the old masters had to get indigo and yellow from plants, and mix them together. The trouble was that yellow faded easily. "So, for thousands of years, green was one of the most elusive colors in the spectrum for dyers," Talbot says. It took "a master dyer to get a really great green." Over the years, green graduated from color to concept to cause. 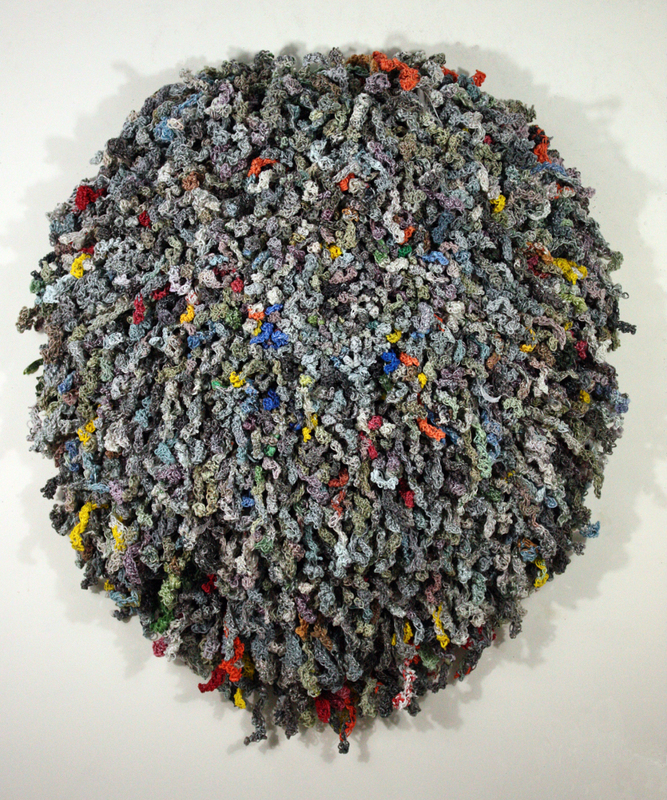 Waste reduction and recycling are big themes for the artists in this Textile Museum show. In a piece called "A Woman of Substance," Jackie Abrams recycles strips of worn-out silk blouses into coils, and twists them into a sculpted basket. William Knight took old tires he found strewn along the sides of the New Jersey Turnpike, shredded them and shaped them into a wall hanging. His piece evokes a terrible traffic snarl. Jodi Collella asked her friends and family to save the little plastic bags used to deliver newspapers. She shredded them, spun them, and crocheted them into One Day. "Although it looks sort of random, it's very carefully thought out," says curator Rebecca Stevens. "He sees these as line drawings, and the fact that he could find a new use for this discarded material was very exciting to him." Artist Jodi Collella asked friends and family to save the plastic bags used to deliver newspapers. Then she shredded them, spun them into a squiggly thread — and crocheted them into a half-dome that clings to a gallery wall like a shield. Not beautiful, exactly — but certainly thought-provoking — about all the things it means to be green. In her 1962 book Silent Spring, environmentalist Rachel Carson wrote of "Earth's green mantle" — that tangle of plants that sustain life as we've known it. 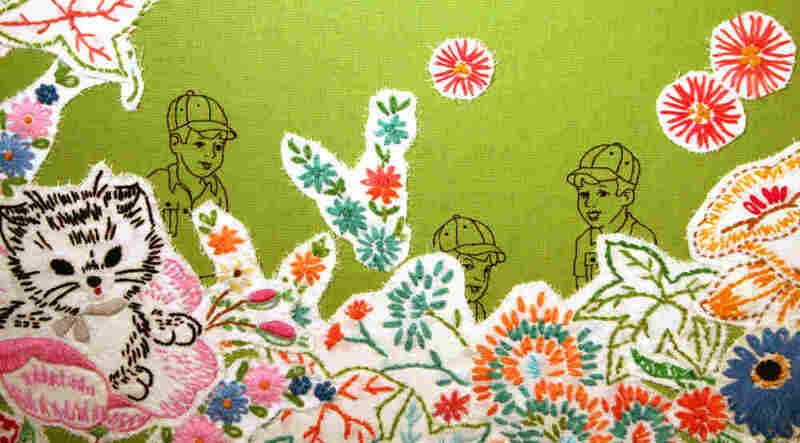 This spring, the show of green at the Textile Museum salutes the Earth, and respects it, artistically.